The Treasury is losing more than £40bn of tax a year because of evasion and the hidden economy, nearly four times official estimates, according to a tax campaigner. 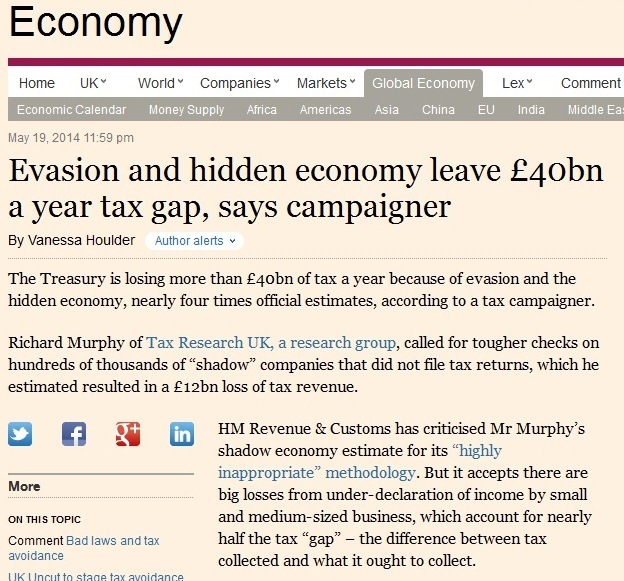 Richard Murphy of Tax Research UK, a research group, called for tougher checks on hundreds of thousands of “shadow” companies that did not file tax returns, which he estimated resulted in a £12bn loss of tax revenue. The report, co-published by TJN, is also covered by the Guardian, the Mirror and the Times. The full report is here. “A new report, written by veteran tax campaigner and chartered accountant Richard Murphy and published jointly by Tax Research UK, the Tax Justice Network and the Association for Accountancy and Business Affairs highlights the staggering scale of the UK’s shadow economy. Based on data on missing VAT published by both HM Revenue & Customs and the European Union the report estimates that in 2011/12 there were £100 billion of sales that weren’t declared to the UK’s tax authorities. That is one pound in every ten of sales in that year. As a result the report estimates that £40 billion of VAT, income tax, national insurance and corporation tax was lost to the UK Exchequer on 2011/12. By 2014/15 based on HM Treasury and Office for Budget Responsibility projections it is likely that this loss will increase to £47 billion. As the report shows, this staggering loss of tax – enough to pay for the combined housing, environment and transport budgets for the UK or half of its education budget – does not happen by chance for a number of reasons. The first is HM Revenue & Customs’ refusal to correctly calculate the size of the UK tax gap – which as the report shows is drastically underestimated by them when it comes to tax evasion. As a result HMRC has willingly reduced its resources – and especially its staff numbers – in the face of demands for government cuts when the result has been a staggering loss of tax revenue that could itself have helped close the deficit and prevent the austerity programmes this country has suffered. But as the report highlights, there is also a collective willingness on the part of both HMRC and the UK company regulator – Companies House – to turn a blind eye to hundreds of thousands of companies that trade in the UK and which never submit their accounts to Companies House and never file tax returns with HMRC. The report estimates that there may be at least 400,000 companies a year that do neither and that those company directors ignoring their responsibilities in this way do so because they know they have almost no risk of being penalised. In effect these two authorities permit hundreds of thousands of companies to undertake tax fraud in the UK each year whilst turning a blind eye to what is happening. The report makes concrete proposals for change including investment of more resources in both HM Revenue & Customs and Companies House. The resources of Companies House could, for example, be doubled by increasing the annual fee for having a company in the UK for £13 to £30. More importantly the report also suggests that the UK’ banks should now advise HMRC each year of those customers for whom they maintain accounts providing details of the address from which they trade and who the company owners are. That way HMRC will know which companies are definitely trading in the UK and so need to be chased for the tax returns and accounts they should be submitting and tax that they owe. The report on which this press release is based is available here. The detailed research which supports that report is available here. The Guardian, Mirror and Times all cover this story too. This will be stored permanently on our reports page. Couldn’t agree more. HMRC’s tactic if they can’t do anhintyg about a legitmate means of mitigating taxation is to rely on their apparent authority in the layman’s eyes and literally scare people into avoiding the use of these perfectly legitimate and quite legal asset and income restructuring exercises.We lose possible 50% of potential business ultimately as a result. No amount of evidence and even contact with reference accounts will convince people that in fact a lot of HMRC’s effort is indeed nothing more than huff and puff.The perception is that regardless of proof of efficiacy and quoting statute that there is “something wrong” with the “scheme” or else everyone would be using it, or that it is “too good to be true” when in fact there is no difference in context as compared with standard accountants’ practices using statutory reliefs to achieve less effective tax mitigation.The use of legitimate tax and wealth protection strategies has therefore become a “leap of faith” which is a shame. a) ‘legitimate’ and ‘legal’ are two different things. What’s legal ain’t necessarily legitimate: for example, think apartheid, in its day. b) Before you say ‘but’ to that last sentence, read this, to understand better what tax avoidance is.